Rarely has a 3yo come into the Kentucky Derby with as much hype as American Pharoah did this year. Racing writers and handicappers, jockeys and exercise riders, trainers and clockers, all went to great lengths to spread the hyperbole, seemingly trying to out-do one another at every turn. American Pharoah, we heard, was the perfect racehorse. Undefeated on dirt on his way to Kentucky, he was fresh off of a pair of visually impressive wins at Oaklawn Park in his only two starts since being forced to withdraw from the Breeders’ Cup Juvenile the previous November. Those wins, and his training before and after those wins, seemed to have everything. He looked the part. He was a beautiful mover. He handled a sloppy track without issue. He was able to track off of a runaway speed horse before handing that horse, and six others, a comprehensive beating in the Grade 1 Arkansas Derby. His morning breezes following that race had clockers gushing like never before. It wasn’t a question of whether American Pharoah was better than his contemporaries. It was a question of how much better. Might he be the best horse of the last decade? The last two? Three, maybe? Was he the best colt since Seattle Slew? Better than Seattle Slew? Sure, it got a little out of control there for a minute. And then a funny thing happened. American Pharoah went out and did exactly what all those people said he would do. He won the Kentucky Derby. And all of the fawning stopped. Racing can be a fickle game, and it seems American Pharoah wasn’t impressive enough. Engaged in a real battle for the first time in his young and relatively inexperienced life, American Pharoah emerged at the end of that 10-furlong stress test with a one-length victory over the other two “fastest” colts of the prep season. But American Pharoah had made a mistake. He had worked too hard. Had felt the sting of Victor Espinoza’s whip a few times too often. By the time he had dug down deep enough to fight his way to the lead, there was no time left, no energy left, to showboat through the wire. He wasn’t Seattle Slew. He was, it seemed, just another Derby winner. Suddenly, the talk was no longer about how much better American Pharoah was than the other 3yos in this crop. It was about who might have the best chance to beat him in Baltimore. About that we shall see. Because we follow racing in the era of the “less is more” theory of performance, which is subscribed to by most of the owners and trainers involved in the game at this point, we are only going to see seven others step in against American Pharoah on Saturday. Of the 18 3yos who lined up at Churchill Downs two Saturdays ago, just five have returned to race in the Preakness, and we have that many only because D. Wayne Lukas still trains Mr. Z. The others have more important races awaiting down the line. We will have 4 of the first 5 across the wire in the Kentucky Derby, including the first three finishers from that race, and that is a good thing. The Derby was a race that was dominated up close. 3rd-place finisher Dortmund, runnerup Firing Line, and winner American Pharoah were all away in good order, and then quickly out to take up positions on the pace, in that order, through the early stages. They would stay that way all the way around to the top of the stretch, where Firing Line would briefly take over, and then engage in a hard duel with American Pharoah down to the finish, those two leaving Dortmund behind to save 3rd. The closers were relative non-factors on the day. According to our Pace Projector, the Preakness may be run in a similar manner. #2 Dortmund is expected to be the early leader once again. #8 Firing Line and #1 American Pharoah will be tracking his pace, and they will be joined by the most interesting of the new shooters, #7 Divining Rod. #4 Danzig Moon, a well-beaten 5th in the Derby after keeping himself within range of the pace throughout, appears to be the most capable of the closers, which doesn’t figure to have the Big 3 here losing all that much sleep. #3 Mr. Z could be more of a pace presence on Saturday. Once a Zayat Stables color-bearer, alongside American Pharoah, he has been sold to race for Calumet Farm, while remaining in the care of trainer D. Wayne Lukas. Mr. Z is a gutsy colt who doesn’t mind a good fight, and his best races have all come when involved from the outset. We think he gets sent, though whether he has enough left after some over-long and strenuous campaigning is a legitimate question at this point. #1 is American Pharoah. Odds-on on the ML, the Derby winner has drawn what seems to be a very unpopular stall at the rail. That has the potential to alter some plans for Victor Espinoza, though, in reality, it is not a bad place from which to begin. American Pharoah is not a slow horse. He can come running out of there from the rail and get his position going forward right from the start, all while saving some ground. If no one else appears to be going, he can go (the first three wins of his career were accomplished in wire-to-wire fashion). Should Dortmund, or even Mr. Z, appear to be intent on the lead, he can let them go, and take up a tracking trip while awaiting his opportunity to switch out to the clear. His Derby win may not have been the tour de force many were anticipating, but let’s be honest here: He ran a very good race on the day. Sure, he had a soft trip (wide or not, tracking an ordinary pace out in the clear is not a tough go), but so did the two horses he had to close down through the stretch, and close them down he did. He earned a new TimeformUS Speed Figure top of 127 for that effort. Can he run another race to that level now, in what will be his fourth race in nine weeks? That is the real question surrounding American Pharoah at this point, from our perspective. He may not be in a different league from these horses, as so many had wanted him to be, but, based on the Kentucky Derby, he is a bit better than they are. If he can maintain his current form, or step forward one more time, he is going to be very hard to beat in this race. That he will do either of those things is no cinch, however. #2 is Dortmund. A towering stablemate of the Derby winner, he was undefeated on the way to Kentucky, and emerged with his first career loss. That race aside (for now), there remains plenty to like about this colt. He has speed, but does not need the lead to win. He was faster than American Pharoah going into the Derby, having run TFUS Speed Figures of 124 and 122 (American Pharoah’s top prior to the Derby was 121), and he earned another 124 at Churchill Downs. He had defeated the talented Firing Line twice in graded stakes races, and sent that horse searching for easier prey in New Mexico for his final prep. There is nothing wrong with a third-place finish in the Derby, especially one that earns a figure that matches your career top, but within the context of this year’s race, Dortmund was one of the disappointments. From our point of view, he had an easy time of it on the lead. It wasn’t that the pace was slow. It wasn’t. But it wasn’t ridiculously fast, and Dortmund was controlling it up there without having to do any racing at all up the backstretch. For a horse of his talents, that kind of trip was supposed to make him a very tough customer through the stretch. But it didn’t. He managed to cut the corner to briefly hold his advantage, but he was never stopping American Pharoah and Firing Line once they came for him, and he only narrowly managed to save 3rd at the end. He gets a slightly shorter distance to work with on Saturday, and there has been some talk from Baffert’s barn that Dortmund had a brief bout of colic prior to the Derby. Not enough to keep him from the race, but was it perhaps enough to leave him vulnerable at the end of his first ever run over 1 1/4 miles? 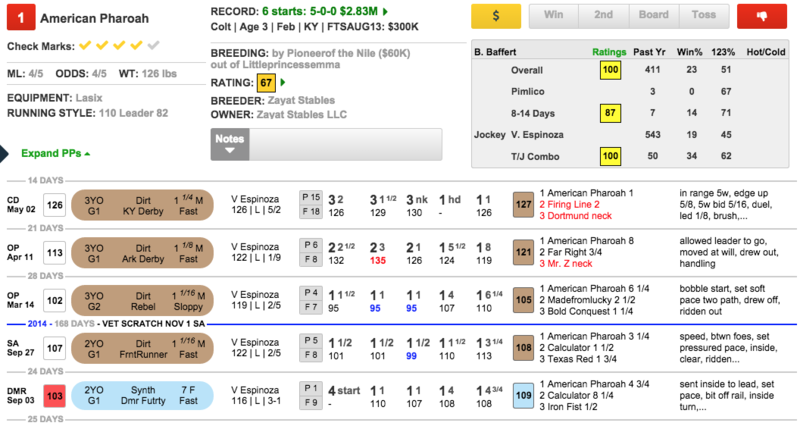 That seems a reasonable position to take, and, if he is back at full strength for the Preakness, we think he is the one with the best chance to put an end to American Pharoah’s Triple Crown dreams. #3 is Mr. Z. Late addition to the field had to get himself sold in order to find his way into the starting gate. He is clearly a talent, one who earned an impressive TFUS Speed Figure of 114 when running both Dortmund and Firing Line to a close photo in the Grade 1 Los Alamitos Futurity. That effort seemed to take its toll on him, however, and since bolting while appearing on his way to victory at Oaklawn in his very next start, his form has fallen off noticeably. We think he can be a pace factor in this race. We would be surprised were he to be more than that. #4 is Danzig Moon. Derby 5th-place finisher earned new career top TFUS Speed Figure of 119 for that effort, though he was never a threat to get a bigger piece of that race at any point. He was in some traffic early on, but it was nothing of the type we’ve grown accustomed to from the roughly run Derbies of the past, and Danzig Moon was able to settle into a nice trip along the inside while in range of the leaders. He was clear for the stretch run, and he did his best while giving chase to the top 3 finishers, but he could only stay evenly and was outfinished at the end. His best chance may be to stay back and hope the Big 3 go at each other enough to set things up for one late run, though he has never before been ridden as a one-run closer. #5 is Tale of Verve. Recently broke his maiden in career start #6 with a TFUS Speed Figure of 81. There are entry-level allowance races out there that he would not be competitive in. #6 is Bodhisattva. The Preakness has something of a history of longshot local runners entering and then outrunning their odds. He is a candidate to fill that role. #7 is Divining Rod. Talented colt ran a TFUS Speed Figure of 107 when finishing a close 2nd in the Grade 3 Sam F. Davis back in January, and he came right back with another solid performance despite being no match for Carpe Diem in the Tampa Bay Derby. His recent Lexington win should have him arriving here in fine form, as that win came easily after a perfect trip, but he is clearly going to have to rise to a new level if he is going to defeat American Pharoah, Dortmund, and Firing Line. Tall order for a good horse. #8 is Firing Line. Plenty to like about this fast and talented colt, who, so far, has done nothing but show up and run fast races. His TFUS Speed Figures (last 5 races: 111-114-120-119-126) put him on a level with both of Baffert’s big guns, and he has already given each one of those horses a real tussle on the racetrack. While that is certainly a positive, we are starting to look at it as something of a negative, as well. He is 2 for 6 lifetime, with 4 second-place finishes. The losses are all close ones, and he has run both American Pharoah and Dortmund (twice) to photo finishes. But those three close calls were all losses. And they were all races he could have won. That he hasn’t won any of them may be a cause for some concern, especially when he was the one holding the advantage in the stretch each time. He did not change leads during his Derby stretch battle, though that has never been a problem for him before, so we aren’t going to worry about that. He projects for another perfect trip stalking up close from the outside, and he is a major threat to reverse that result with American Pharoah from two weeks ago, but he is starting to put himself in the position of having to come out on top in one of these races eventually in order to keep his reputation intact. 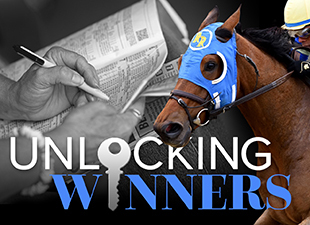 American Pharoah is the horse to beat at short odds, and he is the most likely winner of the Preakness. Dortmund is the horse most likely to upset the favorite, and he may wind up being a playable price–with Firing Line there to take more money this time. Divining Rod is the most interesting new face, though he is unlikely to do better than the bottom slot of trifectas and supers.